Steamboy (Revere MA US) on 2017-02-03 06:29:38. Unique locomotives, good sound films from Maynard Lang and Elwin purrington, but unfortunately during the closing credits, Greg forgot to credit John Edward Hingsbergen for the narration. Not to mention the additional videotape footage of the Minnesota ore dock and a robotic Yellowstone shot in 1999 by Les Jarrett. Grandad (COMOX,BC) on 2014-03-03 08:11:17. Good action of Yellowstones hard at work. 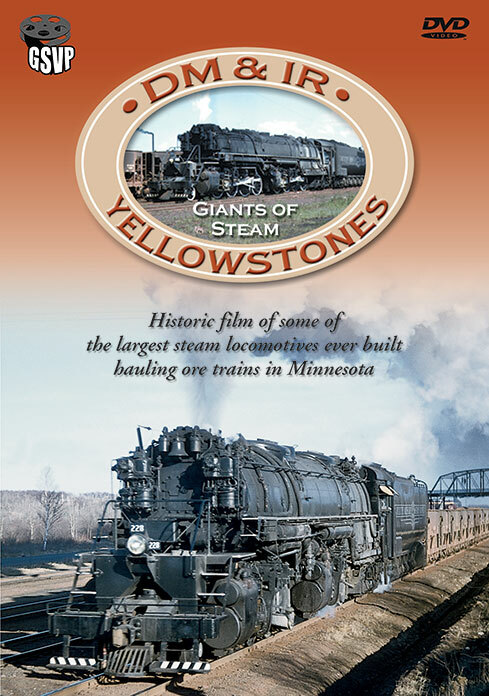 I enjoyed this dvd and would recomend it to anyone who likes big steam at work. Bob Helm (Jonesborough, TN) on 2011-01-13 17:15:11. Excellent video with a lot of pacing shots of the steam monsters. One of my favorite engines. Could have used more content like yards, facilities and other engines but it is what it says on the label. Yellowstones! Joshua Craig Beytien (Iowa) on 2018-05-08 17:49:31. I used to have this video on VHS back in my family vacation at the Wisconsin Dells.